It seems so in the international Trademark Protection field. There has been quite a surge in “fraudulent notices” in the past decade. 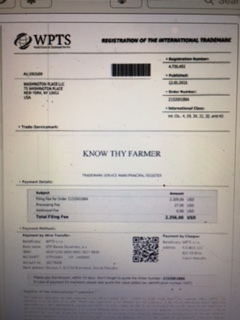 The records of the United States, and most other countries, are freely accessible on the internet, which has spawned a steady stream of official looking invoices, containing information gleaned from official registers, requesting payment for non-existent services. Devious shysters have always tried to make a quick buck, mailing fake invoices demanding payment for imaginary trademark protection services. In the U. S., before the Internet, when we caught these notices we turned them over to the U.S. Post Office for prosecution as mail fraud. The sharp increase of more and more official looking documents, containing pertinent information gleaned from official registers became noticeable once most countries’ Patent and Trademark Office data bases became publicly searchable and accessible. Some practitioners dismissed these notices at first. Their lack of concern stemmed from a belief that the notices were random, few in number, and only targeted individual trademark owners, who would seek the advise of counsel upon receipt and realize they were phony. But the new sham notices are so convincing even large companies with many marks have fallen prey. The notices seem so plausible they pass through the mail room or the general email mailboxes and are sent directly to the bookkeeping department for payment. Some phony invoices are for small amounts, under $400.00, to more easily slip under the radar. Others are for thousands of dollars. Some entitle the payor to a listing in a fictitious register of trademarks in a foreign country. Others simply demand payment to secure maintenance of current rights. 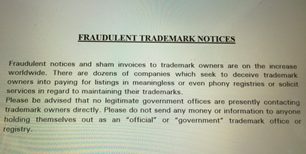 I worked on a committee at the International Trademark Association which researched the problem and got INTA to post a warning on its website. My firm adopted the practice several years ago of sending a warning with every certificate of registration. We advise that no further fees will be due for five years, therefore trademark owners to beware of these invoices and notices. Trademark owners on the receiving end of these notices have to take advantage of the same easy access to information, investigate the companies behind the demands and turn them over to the proper authorities. This upward tick in fraudulent notices still continues. This warning bears repeating.